The number of accounts of bravery by those of young age found in the Sikh history cannot be found in the history of the rest of the world. The struggle, started by Baba Jarnail Singh Ji Khalsa Bhindranwale against the oppressive Hindu government contains the accounts of great martyrs of youthful age who accomplished many great tasks. 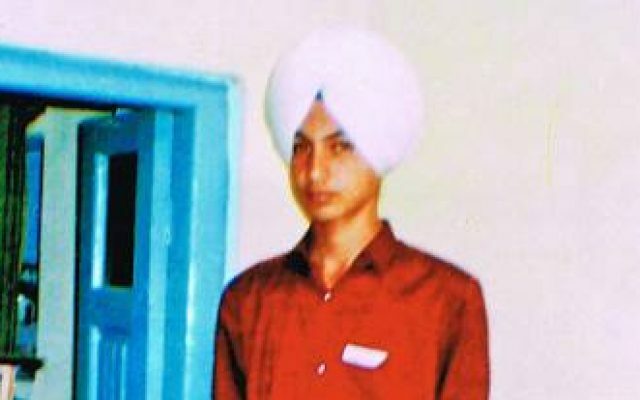 Of these young martyrs, the name of Bhai Arvinderjeet Singh Goldy is one of the most outstanding and unforgettable. Bhai Sahib was born on August 29, 1972 to Bibi Kashmir Kaur and eminent journalist from the city of Amritsar, Sardar Mohinder Singh. His family was doing very well financially during his childhood. During his early years, Goldy had been very fond of playing with toy weapons. At that time, Goldy perhaps had not known that he would have to play with these very same toy weapons but in their real form. Arvinderjeet Singh also had two younger brothers by the names of Kuljinder Singh and Arvinderjeet Singh. Goldy had obtained his primary education from Sultanvind Village School. Then until the 10th grade, he attended the eminent school in Amritsar named Sant Singh Sukha Singh Senior Secondary School, Mal Road. Goldy completed grade 11 and 12 at the Government Senior Secondary School in Town Hall, Amritsar and for his college education, he enrolled at Khalsa College Amritsar. During that time, the state of Punjab was facing the wrath of the Indian Army in the form of Operation Blue Star. Even after Operation Blue Star, the state of Punjab still had to face the rage of the Indian Government’s security forces. During Operation Blue Star, Goldy was about 11 or 12 years of age. At the age of 12, Bhai Avinderjeet Singh was given the gift of Amrit from the Panj Piyareh. Now Goldy was secretly doing a lot in support for the Sikh freedom struggle, but he was still in contact with his family. Bhai Arvinderjeet Singh’s nickname within the circle of freedom fighters was Bhai Mehtab Singh Dheera ‘Amritsari’, Lt. General ‘Khalistan Liberation Army’. “So many Singhs are being martyred…have you sent your son…?” Goldy asked. His mother had no answer for these questions. Bhai Arvinderjeet Singh would often say that Sant Jarnail Singh Ji’s soul is probably asking, what kind of people are these Sikhs, they still have not brought Bhajan Lal ‘Bhajna’ to justice. Goldy had not yet even grown a full moustache but his bravery was very well known in the entire area and still is. At night in the Sultanvind area, the security forces would setup numerous checkpoints. One day Goldy was walking alone over Sultanvind canal bridge with an AK-47 rifle in his hand and entered the open area in a village. In the darkness, the policemen at one checkpoint challenged Bhai Arvinderjeet Singh. Goldy opened fire on the policemen manning the checkpoint with his AK-47 rifle. After firing for some time, Goldy tricked the policemen, returned home and went to sleep while the policemen kept firing on the empty ground. In the same manner one day before sunset, Goldy was riding his bicycle on the Jalandhar G.T. Road while carrying an AK-47 rifle. One government leader was traveling on the road along with his bodyguards and upon seeing them, Goldy opened fire on their car. Security forces stormed the area taking up positions and began firing but by that time, Bhai Arvinderjeet Singh had already reached his home and was eating Mango ‘murabaa’. It is said that at the time Goldy had reached home, the security forces were still blindly firing at some unknown target. Feeling ashamed, the homeowner handed the money back to Goldy. On his way out, Goldy began explaining to the homeowner: “If you consider the freedom movement to be legitimate then give up the idea of having the freedom fighters settle your personal scores because if we eliminate one guilty person then hundreds will become ready to join the movement but if we eliminate one innocent person then hundreds of people will distance themselves from it…” The homeowner nodded his head in agreement and Bhai Arvinderjeet Singh and his fellow freedom fighters walked out of the house. Bhai Arvinderjeet Singh was arrested twice by the police but they were unable to get any information from him. Bhai Goldy put his heart into the work he did for the Sikh freedom movement. When some innocents would be killed in villages and the Sikh freedom fighters were blamed by government sources, Goldy would go to the area and find out who was the actual culprit and let it be known to the villagers. Then came the day of June 10, 1992, on this day many Sikhs active in the freedom movement had gathered in the village of Malowal (close to Ajnala) in the Majha area, and Goldy also attended this meeting. After the conclusion of the meeting, Goldy was getting a ride to the bus station from another Singh on a bicycle. While traveling they came to a checkpoint, which was manned by five soldiers of the Indian Army. Upon reaching the checkpoint, Bhai Arvinderjeet Singh and the Singh who was giving him a ride were stopped by the soldiers. The soldiers forwarded to begin searching both Singhs. Goldy pulled out his 455 bore revolver from his pocket in a lightening fast movement and began firing on the soldiers. He shot 3 of the soldiers dead and left the other 2 wounded. Goldy knew that a patrol of soldiers would come running to investigate the sound of gunfire so he began pulling on one of the dead soldiers guns, but it would not budge as the soldier had used a chain to tie it to himself. While Goldy was struggling with the gun, an army jeep on patrol had approached his position but still Goldy kept trying to get the gun into his possession. Bhai Arvinderjeet Singh then dropped the soldier and took up a position behind a dirt mound in the field next to the road. Goldy only had one remaining bullet in his revolver and fired that at the soldiers in the jeep. In response to Bhai Goldy’s firing of a bullet, the soldiers martyred this great warrior of such a young age by opening fire from their LMG machine gun and filled his chest with bullets. Martyr Bhai Arvinderjeet Singh’s hair did not open up nor did his turban come off. He also took the bullets straight in the chest. Goldy stayed true to his word in the end. Kirpal Singh, the one who was taking Goldy to the bus station was caught alive by the army soldiers. In the nearby fields, some female workers told of Goldy’s fate and his martyrdom at the hands of the Indian soldiers. They said that the soldiers talked amongst themselves about what people will say when they see that a mere child is responsible for the killing of three soldiers from the Indian Army. To make this seem like an encounter, they also killed Kirpal Singh on the spot and falsely announced that two terrorists have been killed. Bhai Arvinderjeet Singh’s mother became an example for all Sikh mothers when not even one teardrop came from her eyes during her son’s funeral. From the soil where Goldy’s blood drenched, certainly one day from that soil the crop of freedom shall grow for the Sikh Nation as every drop of that sanctified blood went for the mission of liberating the Sikh Nation.